ORANGEBURG, S.C. (AP) — After years of battling the Confederate flag, a South Carolina restaurant owner has surrendered. Tommy Daras says he’s selling his Edisto River Creamery in Orangeburg because he’s been unable to remove the rebel banner flown by the Sons of Confederate Veterans on a tiny piece of property in front of his business. The Sons of Confederate Veterans were given a 130-square-foot piece of land by the building’s previous owner and continue to fly the flag by a Confederate monument. Daras first tried to remove the flag himself, but the sons group said it would have him arrested for trespassing. 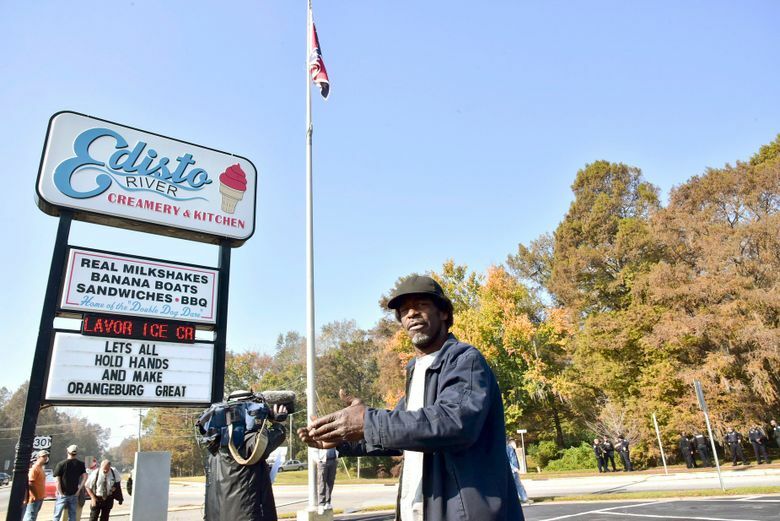 He then argued to Orangeburg officials that the flag violated zoning ordinances because it was a historical display on property set aside for commercial use. But the city ruled the flags were a form of free speech protected under the U.S. Constitution. Daras said eventually nine out of every 10 customers could ask about the flag. Members of the Sons of Confederate Veterans marched around the flag in his parking lot each Saturday. His business received false or negative reviews both from people supporting the flag and by people angered by it. Sons of Confederate Veterans Camp 842 Keeper of the Flag Buzz Braxton did not talk to the newspaper about the property’s sale. The restaurant has already been closed for a month. Daras said his restaurant had five-star ratings after it opened, but then negative reviews started coming in from as far away from Texas. “I regret getting into an argument over the flag, but they gave me no choice,” Daras said.